Abstract: Cloud Computing can bring multiple beneﬁts for Smart Cities. It permits the easy creation of centralized knowledge bases, thus straightforwardly enabling that multiple embedded systems (such as sensor or control devices) can have a collaborative, shared intelligence. In addition to this, thanks to its vast computing power, complex tasks can be done over low-spec devices just by ofﬂoading computation to the cloud, with the additional advantage of saving energy. In this work, cloud’s capabilities are exploitedto implement and test a cloud-based surveillance system. Using a shared, 3D symbolic world model, different devices have a complete knowledge of all the elements, people and intruders in a certain open area or inside a building. The implementation of a volumetric, 3D, object-oriented, cloud-based world model (including semantic information) is novel as far as we know. Very simple devices (orange Pi) can send RGBD streams (using kinect cameras) to the cloud, where all the processing is distributed and done thanks to its inherent scalability. A proof-of-concept experiment is done in this paper in a testing lab with multiple cameras connected to the cloud with 802.11ac wireless technology. Our results show that this kind of surveillance system is possible currently, and that trends indicate that it can be improved at a short term to produce high performance vigilance system using low-speed devices. 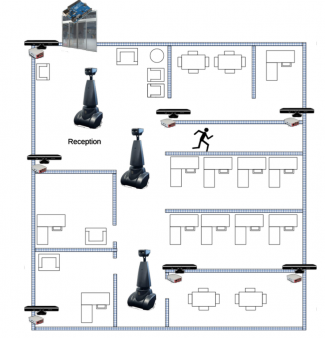 In addition, this proof-of-concept claims that many interesting opportunities and challenges arise, for example, when mobile watch robots and ﬁxed cameras would act as a team for carrying out complex collaborative surveillance strategies.